Part of MultiRec application for IP TS Time Delay System for Multiple Video Streams in Both Standard and High Definition MPEG-2 or H.264 Streams. No software limitation for the Time Delay and Bitrate of IP TS. GigE IP inputs (H.264 or MPEG-2) – UDP and RTP. SPTS or MPTS. Multicast\Unicast. Supports SD or HD incoming IP TS TV Channels. Optionality possible re-encode incoming TS to lower Resolution\Bitrate\Change Aspect Ratio. 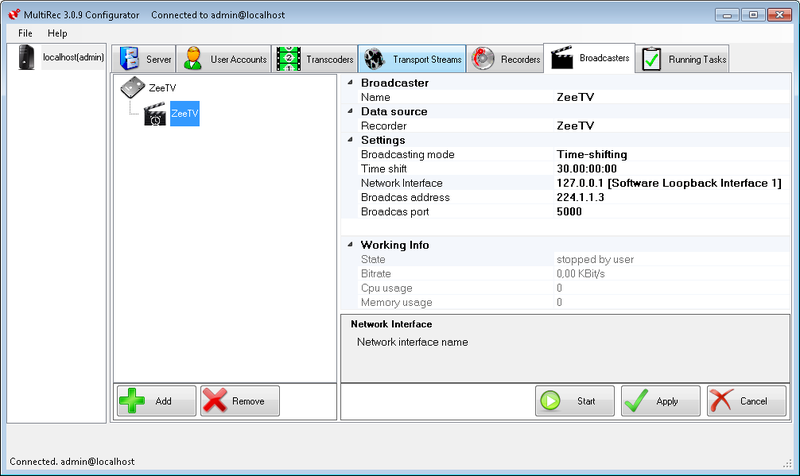 Multiple delayed simultaneous IP streams (MPEG-2 or H.264) UDP. Multicast and Unicast. SPTS or MPTS. Supports internal\external HDD storage for TS video.